Mix the almond flour, salt, vanilla seeds, sugar powder, baking powder, and flour. 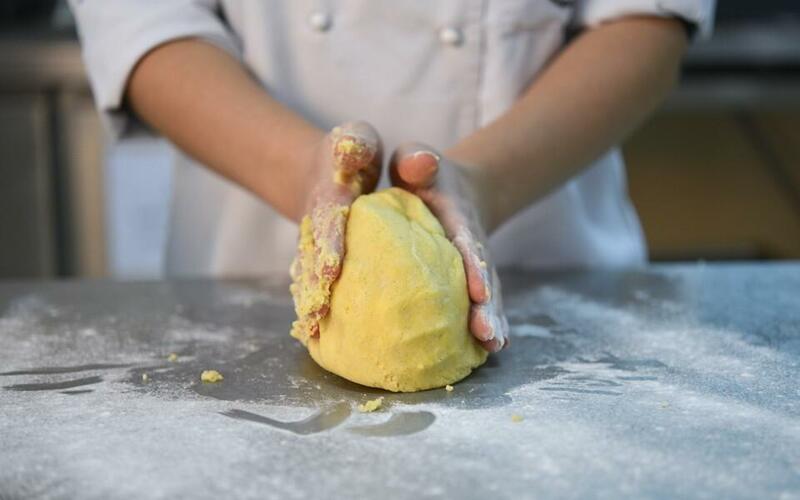 Add chopped crème butter, egg yolks and knead flexible, soft dough, add some flour if needed. Wrap the dough in cellophane and keep in fridge overnight. Next morning flatten the dough on 0.3-0.4cm. Cut out 12cm diameter circles and place them in 8cm tartlet pans. Cut the leftovers. Pierce the bottom with a fork and keep in the fridge for 30-60 minutes. Preheat the oven to 180C. 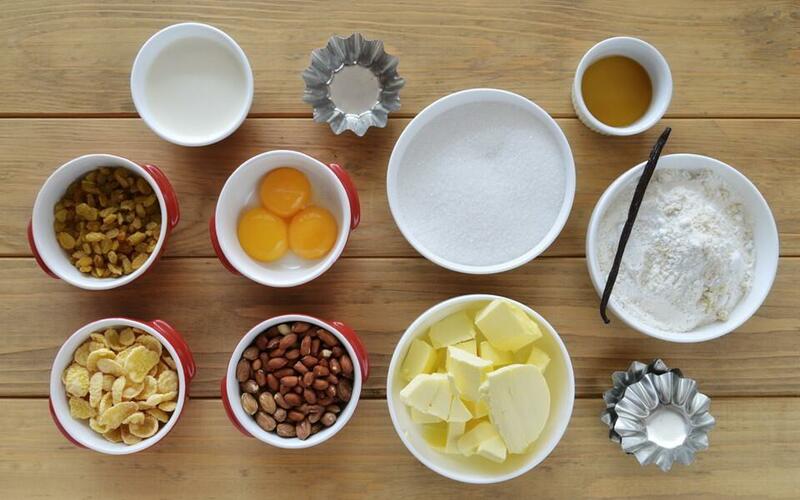 Bake the tartlets for 10-15 minutes or until they turn golden. 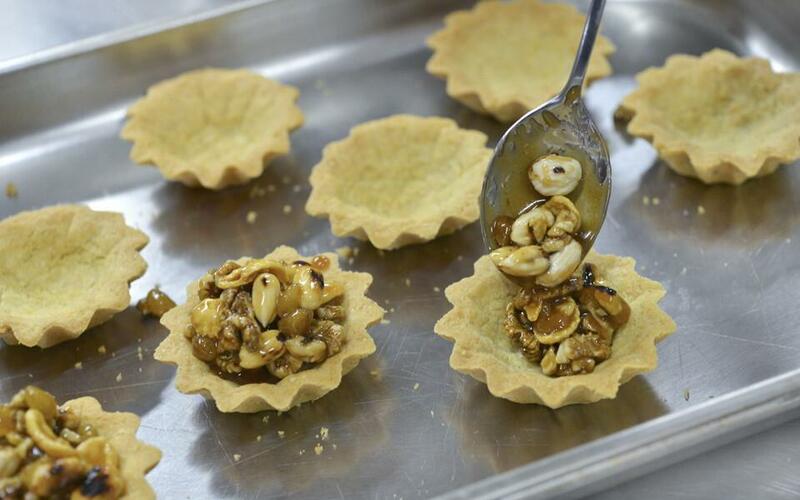 Cover each tartlet with oil-paper and place something heavy on them. Bake for 10 minutes. Then take off the paper and the heavy thing and bake for the next 10 minutes without them, until we get it golden. When it's finally baked, let it cool down. Place the macadamia nuts and walnuts on oil-paper and roast in the 180C heated oven for 7 to 10 minutes, or you can also fry them in a dry pan. Do not roast pistachios, as they'll lose their nice color. Mix sugar, water, and glucose in a deep pot and let it get a caramel color. Meanwhile bring crème and Rum to boiling on separate pans. Take the caramel off the fire and blend with chopped crème butter. Carefully add crème and then Rum. 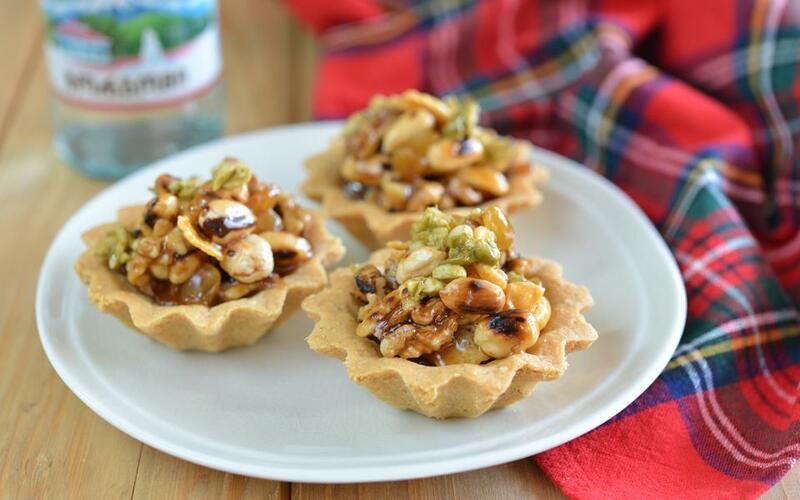 Toss all kinds of nuts and cornflakes into the hot caramel, stir with a wooden peel and quickly start piling the nuts on the tartlets. After filling 3 or 4 tartlets stir the caramelized nut, as the whole caramel will go down to the bottom. Keep on the room temperature. Serve the same day, as soon as the filling cools down.